I think a turning point occurred when I was working as a photographer in London at about the age of 25, and was all alone in a darkroom. 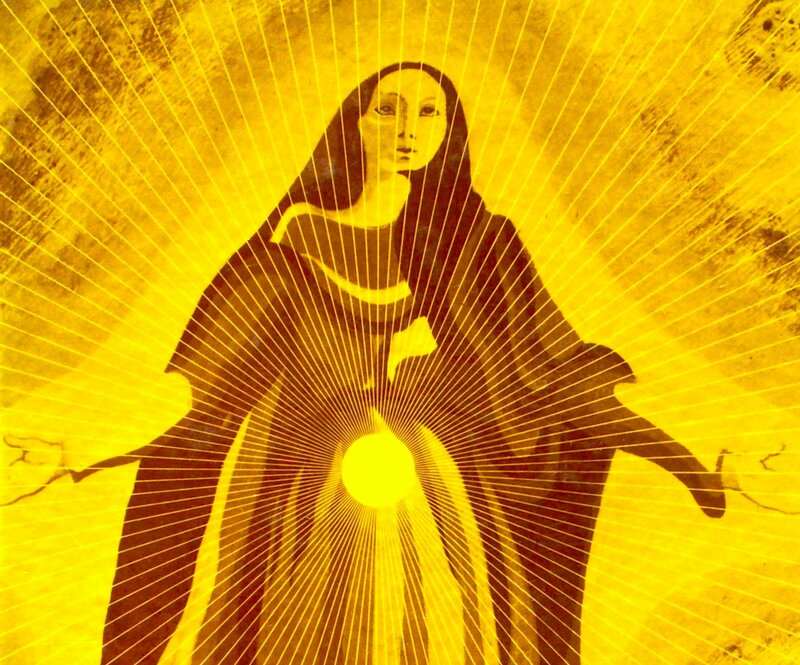 I had been puzzling about the symbolism of the Virgin Mary, and suddenly felt that it represented the ‘virgin mind’. In other words a state of mind that did not hold fast to its convictions or beliefs, but instead was virginal and ready to conceive of the new. In the case of Mary she is shown as a young girl, newly aware of her sexual self, not offering herself to a man, but giving herself without preconceptions and with all her heart and body to the invisible that gives life. Having realised that – the plates I was developing were now in the fixer and I had time just to be – I wondered what would happen if I myself tried to be just like Mary, offering my being wholeheartedly and virginally to the unseen. Immediately I had images of a young woman I knew like a vision, and as if a new slide had been put in a projector, then an image of a baby with a crown on its head. This was so extraordinary I didn’t know what to make of it. But it seemed to be telling me that the daughter of a friend of mine was pregnant and she would give birth to a boy who was a ‘special child’ – more aware than usual. About a fortnight later I had to phone the mother of the girl, and after we had finished our business together I asked her if her daughter was pregnant. She immediately laughed and I asked her why she laughed. She said she didn’t know if her daughter was pregnant, but her daughter was at the doctor’s at that moment to find out. The daughter later gave birth to a son. This is a process that arises from the unconscious that most people do not know how to allow or work with, though Jung has described it well enough, and ancient cultures knew and used it. It is the action of the unconscious process breaking through into waking consciousness. It emerges because the conscious mind takes on a listening and non–interfering attitude. Just as the dream process, while active in sleep, produces spontaneous speech, movements and drama, so, by taking on a passive receptive attitude of body and mind, this process is allowed while awake, and produces similar actions. It is a form of waking lucid dreaming. It is by no means something only known in present times. If you consider the function of the dream process in the light of what has just been described, what was the Pentecostal experience if not a breakthrough of unconscious material into awareness? It was a breakthrough occurring because the group took on a surrendered and receptive attitude to what they called the Holy Spirit.